The Secret Six’s journey in the New 52 has been a tumultuous one. 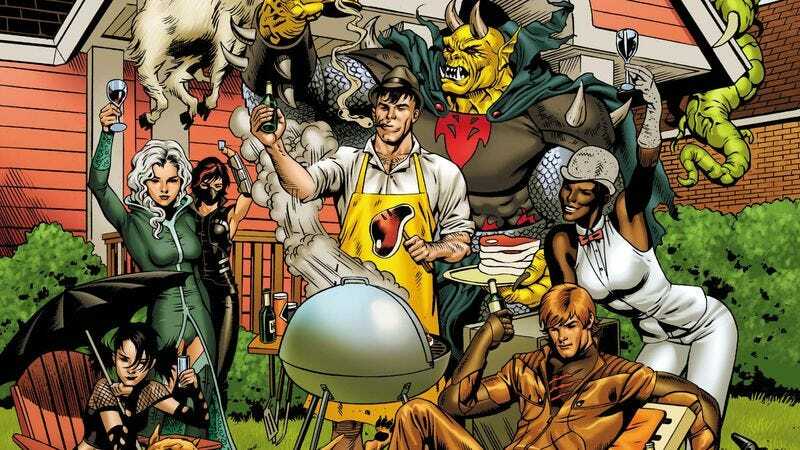 After a lackluster debut for the team of reformed villains, writer Gail Simone did considerable course correction for the Secret Six series, moving the group to the suburbs and devoting more time to building the character relationships that made her original, pre-New 52 Secret Six run so memorable. Beloved figures from that previous run began popping up, and Simone quietly undid one of the great travesties in DC history: the murder of Sue Dibny in Identity Crisis. Simone got the book back on track with the help of artists Dale Eaglesham and Tom Derenick and colorist Jason Wright, but the journey comes to an end in next week’s Secret Six #14. Simone has a few threads to wrap up before the team says goodbye, and the most pressing issue is saving Strix from her forced servitude to Lady Shiva’s League Of Assassins. These preview pages reveal the team’s first course of action, sending a gigantic Black Alice to destroy the League’s headquarters by channeling the mystical power of the Spectre, DC’s resident Spirit of Vengeance. As Alice pummels the building with her supersized fists, Strix faces off against Shiva, using her new tablet to infuriate her opponent by calling her a “turd bird” and saying her breath smells like poop and her hair looks stupid. In classic Simone fashion, this extremely tense moment is when she doubles down on the humor in the script, and both Alice and Shiva reveal their senses of humor in the midst of the high-stakes action. Tom Derenick is one of DC’s most reliable pinch hitters for books suffering from artist delays, and while Dale Eaglesham has tighter linework and more inventive panel layouts, he can’t hit a monthly schedule for a full 20-page comic. Derenick has taken steps to make his art more consistent with Eaglesham’s style, and it’s resulted in some of his strongest recent work, particularly in his depiction of action and character expressions. There’s a lot of energy in these preview pages, and the opening splash page kicks off the issue with gleeful excitement as Alice wreaks havoc on the League. It’s going to be an explosive series finale, but the Secret Six would have it no other way.